I finally read comments on my July 17th blog post a couple of days ago and found that I’d been nominated for the “One Lovely Blog Award” by the inspirational blogger Evangelist Jeanie Shepard. If you’re looking for a “brighter life in Christ,” you should take a moment to check out her blog. Thanks for the nomination, Jeanie! 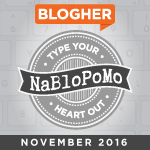 Nominate 5 bloggers and contact them on their posts to let them know they have been nominated. I am a recovering perfectionist. I’ve been in recovery for about a decade+ now. I have to remind myself almost daily that everything does not depend on me and that there’s something beautiful and useful even in imperfection. Otherwise, my tendency for perfectionism–and extreme self-criticism–would consume me. I need a larger home office or a workshop just for crafting. I like the second space idea a little better–then, I wouldn’t be tempted to defer “serious work” for playtime. I have no rhythm for dance. I have at least 7 books in my head that need to come out. I’m making a concerted effort to get at least two of them out of my head by the middle of next year. I do not like driving and would gladly welcome a full-time chauffeur. I’m really missing my baby boy. Every day, the little boy departs a little and I can feel his need for me lessening. His growing independence is a good (and necessary) thing, but my Mommy heart still aches. I do not like hierarchies. I have a new “higher” position at work that reminds me every day that we live in a world in which hierarchies and power really matter to a lot of people, but it bothers me, and I’m trying to figure out how to deal with the psychic clash. Broken Light: A Photography Collective which features the art of those who have been diagnosed with a mental illness. The blog features the work of a different artist in each post. We learn a little about the photographers and get a glimpse of their work. Laura Lynn’s Cancer: My Journey Back to Health–Kicking and Screaming the Whole Damn Way. Her blog is meaningful to me because she is brutally honest about her experience with cancer and it gives me quite a bit of insight into my sister’s feelings when she was on that journey. J. Patterson’s You Can Shout Now, an inspirational blog that uses our (extra)ordinary experiences to discuss the Christian walk and relationship with the Divine. Kollette Hall of The Art of Choosing Joy. Read her “My Story” post and you’ll understand why I find her (and Jason, her husband) “lovely” and inspiring. If you have a little time to spare, take a moment to check out these blogs. There are so many more I would love to nominate, but rules are rules! Happy reading!